As I’ve noted here before, the issue of economic inequality is now deeply embedded in the national debate (here’s why). Gov. Romney may wish the discussion to be relegated to “quiet rooms” but I don’t think that’s going to happen…at least I hope not. Instead, the important thing to do is to aggressively pursue at least two lines of analysis (I’m excluding the basic tracking of the trends, which is obviously needed). One, what is the impact of such historically high levels of inequality, and two, what underlying factors explain the trends? Re #1, I and many others have taken up issues like the relationship between inequality and mobility, or opportunity, the relationship between inequality and growth, and issues of fairness, particularly in the tax code (e.g., see many recent posts on capital gains taxation). In this post, however, I want to raise some issues and show some pictures on an underlying cause—increased corporate profitability. To some extent this is definitional: when more output goes to profits and less to paychecks, there’s higher inequality. * But it’s a part of story that’s germane to both policy and politics in ways I reference below. But how can they have bounced back like this when the economy’s been in the tank—where are their revenues coming from if not here? Well, from over there…abroad, that is. 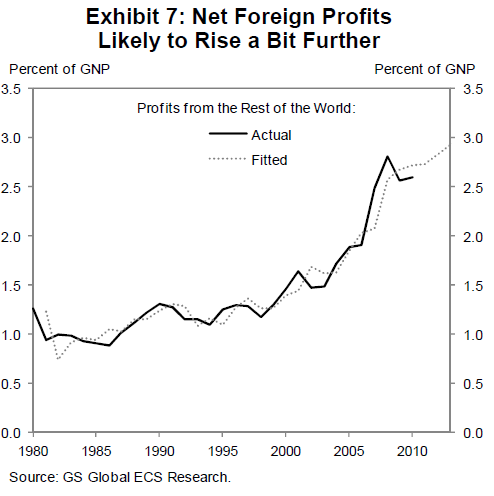 US corporate profits from foreign sources are way up. Under globalization, you go where the demand is. I just mentioned revenues. Remember that profits are revenues minus costs, and that leads us to labor costs. 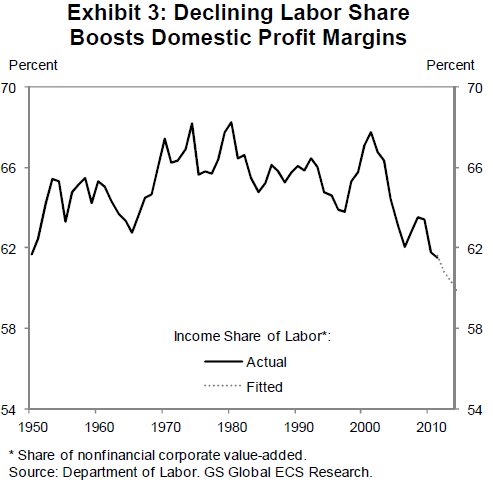 Here’s the flipside of the profitability trend: the decline in the labor share—that part of output going to compensation. Note carefully that upward bump in the 1990s—that was a function of the uniquely tight labor markets that prevailed in those years. And, in fact, if you look back at both of the last two figures—recalling that full employment was more the norm in the 1950s and 60s (and much less so since, excluding the latter 90s)—you get a strong sense of the relationship between tight job markets and who gets what. Well, unemployment is going to stay high for a while, which is why the GS forecast for labor share (dotted line) keeps heading south. High unemployment puts pressure on both employment and wage levels and both will contribute to a weakening claim by most workers on what growth we produce in coming years. In this regard, jobs and bargaining power are among the most important factors to rebalance the scale. Anything that helps create more jobs, lower unemployment, and improved bargaining clout for middle class workers will help reverse these trends. Anything that goes the other way will exacerbate them. A higher minimum wage and greater union power will help, as will progressive taxation. Corporate tax cuts (profits are already at record highs!) and territorial tax policies will not. Low unemployment will help; current rates will hurt. More insourcing will help and visa versa. Right now, monetary and particularly fiscal stimulus will help. Austerity will hurt. Perhaps the main takeaway here is that if you’re a voter evaluating a politician’s economic agenda from the perspective of middle class well-being, corporate profitability isn’t enough. It’s obviously important—we very much want profitable firms, and, as I point out in the technical note below, this isn’t so cut and dry: lots of average people benefit from high corporate profits. But while they all say they’re for the middle-class, if their actual agenda–not what they say about it, but the plans themselves–targets profitability, not paychecks, look elsewhere. *I’m being glib with a technical issue here. There are middle income people who benefit from high profitability, say through pension holdings. But most of this type of income is held by households at the top of the scale (about 90% goes to the top fifth of households). Also, suppose the labor share of national income grows but all the growth goes to the paychecks of the highest-paid workers. That’s inequality inducing as well…so we’re painting with broad strokes here. Above figures come from Goldman Sachs Global Research Group, US Economics Analyst, 1/27/12. Share the post "Profits, Politics, and Policy"
5 comments in reply to "Profits, Politics, and Policy"
I don’t like the “inequality” frame because it sounds like complaining about the fact that talent is not evenly distributed among human beings. Except that isn’t, so . . . yeah. The issue is that rich people are stealing my money, because our system is designed to make it easy to steal money from lots of less-rich people. That’s a big issue! 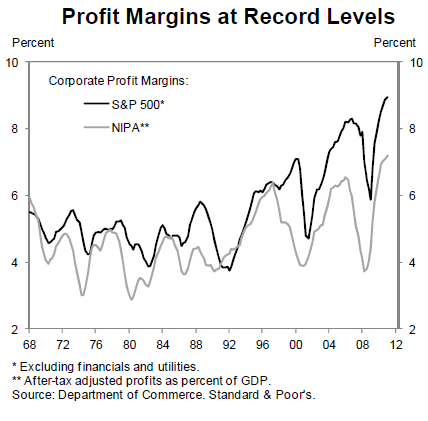 That “Profit Margins” chart is not very convincing. I would prefer to see the difference as a percentage plotted. The data seem noisy and the absolute levels might be clouding the real trend. Jared, I don’t think you were clear enough: corporate profits are very high so cutting corporate taxes in the idea that will spur hiring is silly. The evidence contradicts the argument. Hmmm…that’s what I meant by “corp tax cuts won’t help” but I added a parenthetical phrase to amplify ala your suggestion. Sorry – I take that back I see that both the S&P and NIPA are indicating the same thing.